Oh, those lovable Vikings! Did they, or didn't they? 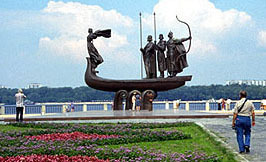 The argument continues today over their precise role in the formation of the early Kievan state in the tenth century. 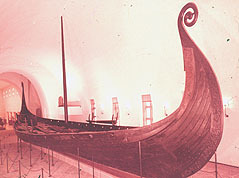 The image on the left is the monument in Kiev to the Vikings; the image on the right is a reconstructed "Oseberg" Viking ship in the Viking museum near Oslo, Norway. Please read the Sample Historical Document Analysis, based on some short excerpts from Hammurabi's code of law. The sample illustrates some of the questions that a historian asks when reading a historical document. This is what you will be doing in this course. Submit the Primary Chronicle paragraph. Have a look at a genealogy of the House of Riurik. Read chapter 2, chapter 3, chapter 4 and chapter 5 from Mary Platt Parmele (1843-1911) A Short History of Russia (1907, 4th edition). These are short chapters, and this is optional reading. For 25 points maximum extra credit, read the Pravda Rus'skaia (Russian Law Code) and write a paragraph in which you offer some analysis of the social structure of Kievan Rus'. For 25 points maximum extra credit, read Grand Prince Vladimir Monomakh's Instruction to His Children and write a paragraph in which you explain the Grand Prince's conception of the political state.